Max comfort, max safety, max style: Mico Max 30. Give your baby a first class ride with the Mico Max 30 infant car seat, featuring maximum comfort, safety, and style from 4-30 pounds. 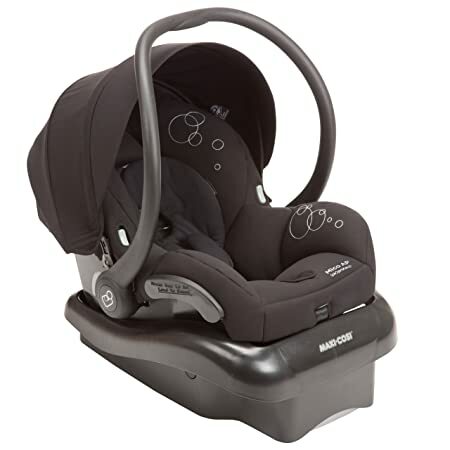 The Mico Max 30 provides superior safety for your baby with air protect side impact protection and a rebound bar to make every ride safer. Self-wicking fabrics composed of bamboo and other natural fibers deodorize and draw liquids away from the skin to keep baby dry and comfortable during the ride. The reversible Cozi-Dozi insert provides head and neck support for smaller babies. The Mico Max 30 is not just easy to clean, it’s the easiest to clean. The innovative seat pad removes with no need to unthread the harnesses, letting you take it off in a few seconds. Once off, the pad is also both machine washable and dryer safe. Putting it back on is easy too, ensuring you can get back on the road quickly. The Mico Max 30 is the lightest premium infant car seat in its class and is comfortable to carry, making it the only choice for a premium travel system. It is fully compatible with your favorite Maxi-Cosi, Quinny and many other premium brand strollers. The base is adjustable to ensure a proper fit in your vehicle and features a one-click latch system for easy installation. The base also includes a rebound bar for added safety during your journeys. 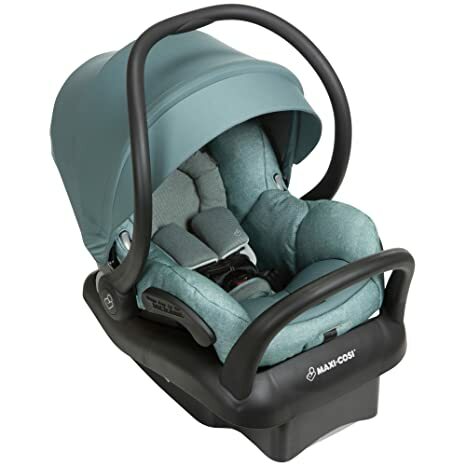 Happy travels are ahead with the Maxi-Cosi Mico AP infant car seat.The Mico AP features Air Protect Advanced Side Impact Technology for a safer ride. The patented Air Protect cushion system protects around your baby’s head, where it’s needed most. 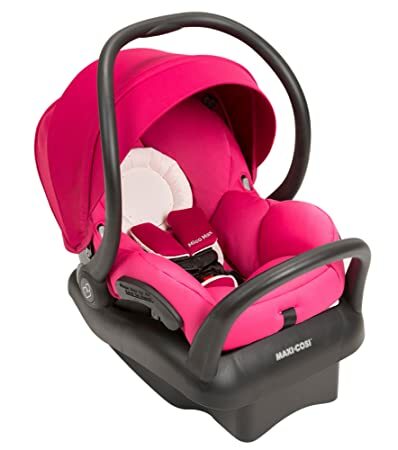 The comfortable premium fabrics and padded 5-point harness covers keep baby secure and cozy during the ride, and the included Cozi Dozi head insert is true to its name and perfect for the extra support needed by infants. 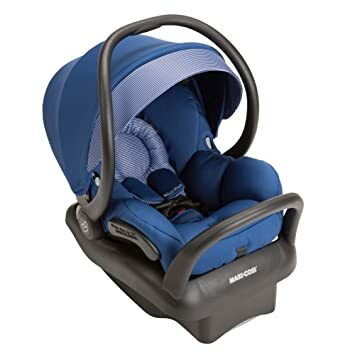 Each Mico AP also comes complete with a multi-position sun canopy with a flip out visor to help protect baby’s sensitive eyes from bright lights.The Mico AP infant car seat is designed to be both lightweight and comfortable to carry. Transferring from the stay-in-car base to a Maxi-Cosi or Quinny stroller is a breeze, making the Mico AP infant seat a great solution for parents looking for a complete travel system they can use from birth. Enjoy traveling made simple by installing an extra base for the maxi-cosi mico ap in your family’s second car. The Maxi-Cosi mico nxt infant car seat is the next generation of the mico infant seat that parents around the world already know and love. As the lightest infant car seat in its class and featuring an ergonomic handle, the mico nxt is easy to carry wherever you go. The mico nxt features cozy fabrics for your baby and a new base release handle, making it easier to remove the seat from the base when it’s time to take your journey outside of the car. Transferring from the stay-in-car base to a Maxi-Cosi, quinny or other premium stroller is a breeze, making the mico nxt infant seat a great solution for parents looking for a complete travel system they can use from birth. The included cozi-dozi head insert is perfect for the extra support needed by infants. The comfortable fabric and padded 5-point harness covers keep baby secure and cozy during the ride. 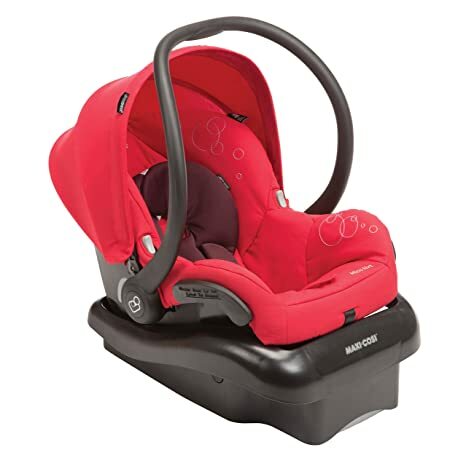 Side impact protection is built right into the seat for a safer ride, and each mico nxt comes complete with a multi-position sun canopy allowing you to protect baby’s sensitive eyes from bright lights. Adapters are included to use mico nxt as a travel system with compatible Maxi-Cosi and quinny strollers. Adapters for many other premium strollers are available from the stroller manufacturer. The Mico AP you love just got even better. Still the lightest infant car seat in its class, the updated seat features new, self-wicking fabrics that deodorize and draw liquids away from the skin to keep baby dry and comfortable during the ride. The innovative seat pad design allows for removal within seconds – no rethreading of harnesses required. The seat fabrics are also both machine washable and dryer safe, making removal for a thorough cleaning quicker and easier than other car seats. The ergonomic handle provides extra comfort for parents while carrying this lightweight seat. Transferring from the stay-in-car base to a Maxi-Cosi, Quinny, or other premium stroller is a breeze, making the Mico AP infant seat a great solution for parents looking for a complete travel system they can use from birth. The Mico AP features advanced Air Protect side impact technology. This patented cushion system provides extra protection around your baby’s head, where it’s needed most. The Mico AP also includes an adjustable base with LATCH for a better fit in your car. The comfortable premium fabrics and padded 5-point harness covers keep baby secure and cozy during the ride, and the included Cozi-Dozi head insert is perfect for the extra support needed by infants. Each Mico AP comes complete with a multi-position sun canopy with a flip out visor to help protect baby’s sensitive eyes from bright lights. Give your family happy travels with a Maxi-Cosi Mico AP infant car seat that makes each journey with baby easier and safer. For adventurous little nomads. Bring a sense of adventure to everything you and your child do with this special edition mico AP by Maxi-Cosi. The Bohemian collection is inspired by hand-crafted items with a focus on tactile fabrics, playful color, and authentic patterns. The special edition Bohemian collection is playful, colorful and unique. It makes you want to have an adventure with your little one and allow your child’s creativity to run free. Hand them the tools to discover and enjoy their own world, inspiring them with the things you love. Happy travels are ahead with the Maxi-Cosi mico AP infant car seat that makes each journey with baby easier and safer. The mico AP infant car seat is the lightest infant car seat in its class and features an ergonomic handle for extra comfort while carrying. Transferring from the stay-in-car base to a Maxi-Cosi or Quinny stroller is a breeze, making the mico AP infant seat a great solution for parents looking for a complete travel system they can use from birth. The mico AP features advanced air protect side impact technology. This patented air protect cushion system protects around your baby’s head, where it’s needed most. The comfortable premium fabrics and padded 5-point harness covers keep baby secure and cozy during the ride, and the included Cozi-Dozi head insert is perfect for the extra support needed by infants. Each mico AP comes complete with a multi-position sun canopy with a flip out visor to help protect baby’s sensitive eyes from bright lights. When compared to similarly priced infant car seats as of January 2014. This Rachel Zoe x Maxi-Cosi Special Edition merges Maxi-Cosi’s design-forward, high quality and industry leading safety with Zoe’s unparalleled, award-winning fashion is truly one of a kind, inspired by the jetsetter lifestyle and paying homage to the luxurious detail found in the design of vintage leather luggage. Premium cognac leather and oversized gold detailing complement classic black and white fabric for a look that is tailored to perfection, allowing parents to enjoy every day with baby in style. Give your baby a first class ride with the Mico Max 30 infant car seat, featuring maximum comfort, safety, and style from 4-30 pounds. 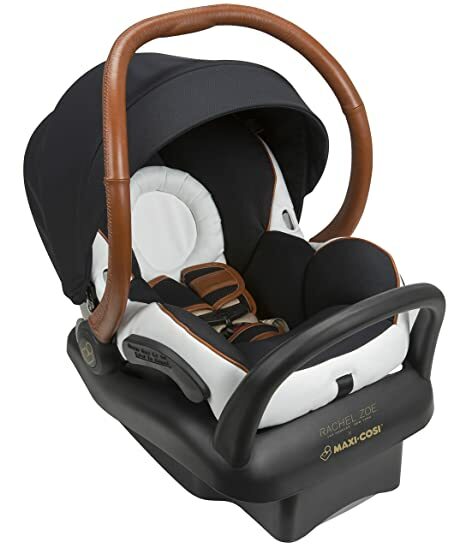 With an authentic cognac leather wrapped handle, gold tone harnesses, and leather detailing; this Mico Max 30 is a step above the rest.The Mico Max 30 provides superior safety for your baby with Air Protect Side Impact Protection and an anti-rebound bar to make every ride safer. Super soft padding and luxurious fabrics keep baby comfortable during the ride. The reversible Cozi-Dozi insert in classic black and crisp white provides head and neck support for smaller babies. The Mico Max 30 is the lightest premium infant car seat in its class and is comfortable to carry, making it the only choice for a premium travel system. It is the perfect companion piece for the Rachel Zoe x Quinny Moodd stroller. Together they form a travel system that is truly unmatched for quality and style. The Mico Max 30 is also fully compatible with your favorite Maxi-Cosi, Quinny and many other premium brand strollers. The base is adjustable to ensure a proper fit in your vehicle and features a one-click LATCH system for easy installation. The base also includes rebound protection for added safety during your journeys. 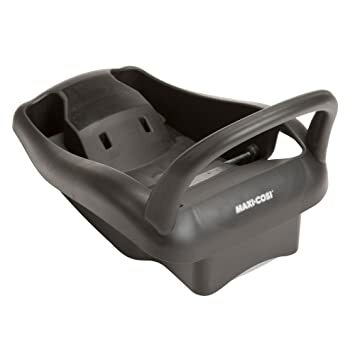 Enjoy traveling made simple by installing an extra base for the Maxi-Cosi Mico in your family’s second car. The new Maxi-Cosi base includes rebound protection. 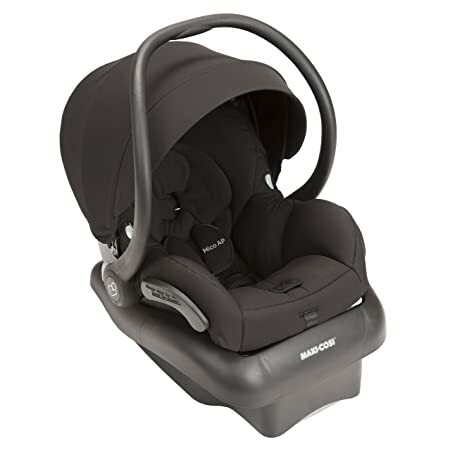 Max Comfort, Max Safety, Max Style: Mico Max 30.The Maxi-Cosi Mico Max 30 provides superior safety for your baby with Air Protect Side Impact Protection and an anti-rebound bar to make every ride safer. 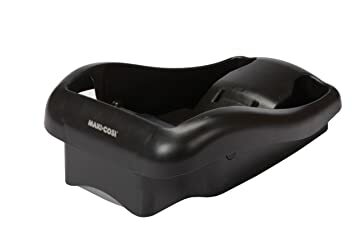 The reversible Cozi-Dozi insert provides head and neck support for smaller babies, giving them a snug and safer ride.The Mico Max 30 infant car seat is not just easy to clean, it’s the EASIEST to clean. The innovative seat pad removes with no need to unthread the harnesses, letting you take it off in a few seconds. Once off, the pad is both machine washable and dryer safe. Putting it back on is easy too, ensuring you can get back on the road quickly.The Mico Max 30 is the lightest premium infant car seat in its class and is comfortable to carry, making it the only choice for a premium travel system. It is fully compatible with your favorite Maxi-Cosi, Quinny, and many other premium brand strollers. The Mico Max 30 stay-in-car base is adjustable to ensure a proper fit in your vehicle and features a one-click LATCH system for easy installation. Max Comfort, Max Safety, Max Style: Mico Max 30. 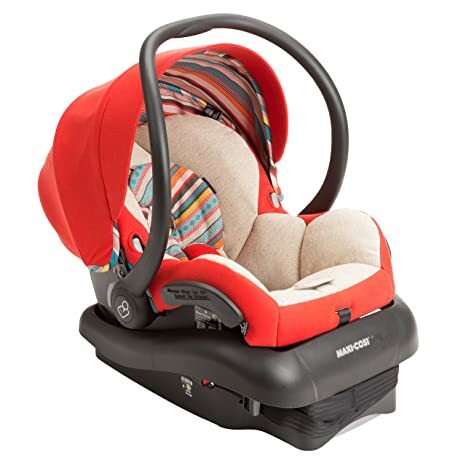 The Maxi-Cosi Mico Max 30 provides superior safety for your baby with Air Protect Side Impact Protection and an anti-rebound bar to make every ride safer. The reversible Cozi-Dozi insert provides head and neck support for smaller babies, giving them a snug and safer ride. The Mico Max 30 infant car seat is not just easy to clean, it’s the EASIEST to clean. The innovative seat pad removes with no need to unthread the harnesses, letting you take it off in a few seconds. Once off, the pad is both machine washable and dryer safe. Putting it back on is easy too, ensuring you can get back on the road quickly. The Mico Max 30 is the lightest premium infant car seat in its class and is comfortable to carry, making it the only choice for a premium travel system. It is fully compatible with your favorite Maxi-Cosi, Quinny, and many other premium brand strollers. The Mico Max 30 stay-in-car base is adjustable to ensure a proper fit in your vehicle and features a one-click LATCH system for easy installation.